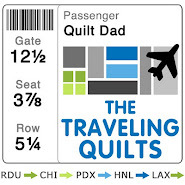 Quilt Dad: Big Apple Bound! I'm so excited to be heading back to my hometown of New York City tomorrow for the Quilters Take Manhattan event, sponsored by the Alliance for American Quilts! 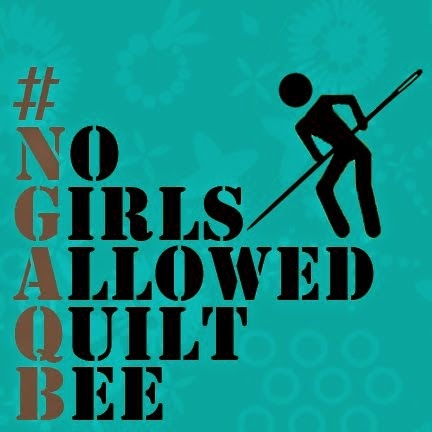 The Alliance for American Quilts (AAQ) is a nonprofit 501c3 organization established in 1993 whose mission is to document, preserve, and share our American quilt heritage by collecting the rich stories that historic and contemporary quilts, and their makers, tell about our nation's diverse peoples and their communities. I am so honored to have been invited by the AAF and my friend Victoria Findlay Wolfe of Bumble Beans to participate as part of a panel discussion on Friday night. The topic of the discussion is Modern Stories: Documenting the Modern Quilt Movement, and I'll be joining my pal Jennifer Paganelli and some other fabulous quilters on the panel. Moderating the discussion will be one of my all-around favorite people, the fabulous Jackie Kunkel of Canton Village Quilt Works. I hope you'll go easy on me, Jackie! And then on Saturday afternoon, Marianne Fons and fabric designer extradordinaire (and Project Runway season 1 winner) (oh, and our Fat Quarterly Modern Madness winner!) Jay McCarroll will host a fun event at FIT. I'm really looking forward to spending some time both at home with my family and with so many fellow quilters and artists in New York City. Heather and Thomas will be there, and I'm hopeful that Kate Spain can make it too. With so many fantastic people all in one place, how can it be anything but a blast?! I'll try to take some good pictures! Oh you name dropper you...just keep it up...rub our noses in the fact that we won't be there too! :) Maybe one day! Thanks bunches for the shout out on my DQS11...I have listened to all the wonderful advice and pulled up my bootstraps and sewed the label on the back! Have a great time and we will all look forward to your report! Looking forward to seeing you tomorrow! Hi John what fun all of my favourite people there to. I will be waiting to hear all about it. Very cool! Have a safe and fun trip ! Oh, how I'd love to be in NYC again, especially for a quilt show. Hello John I just came across your blogg, how long have you been quilting? Enjoy being back in the 'hood! It was so good to see you again! And as usual you were a natural. Just a great time and a fabulous addition to our panel. Thanks! Thanks so much John for coming! It was great to see and hear what you had to say! fabulous! It sounds like a lovely time, and I hope you had fun! Super exciting! I hope you had a great time.